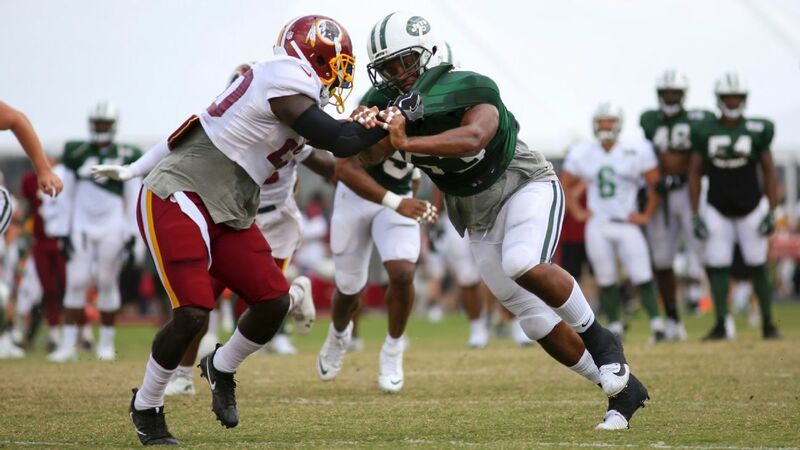 RICHMOND, Va. -- A joint practice between the Washington Redskins and New York Jets that grew chippy Sunday ended up in what players said was a predictable turn, with a melee along the sideline that spilled into the crowd. And Redskins players said they knew it was going to happen. The Redskins-Jets practice was shortened by approximately 25 minutes because of thunder and lightning, but the weather might have prevented more fights. "In 12 years, I've never seen anything like that," Redskins tight end Vernon Davis said. But several Redskins said they knew something like this would happen. Their last joint practice, in 2015 against the Houston Texans, also featured a number of fights, including multiple times when both sidelines emptied. "It wasn't like nobody didn't know that was going to happen in the first place," Redskins cornerback Josh Norman said. "You have these joint practices, you expect it to happen. You get guys trying to come out and get some good work. Some guys do things that other guys don't like. That's kind of what happens. Though there were a number of near-skirmishes, particularly between the Redskins' offense and Jets' defense, one play resulted in a lot more. On another hot, humid day, tempers already were on edge when Redskins running back Chris Thompson ran around the right end. Redskins tackle Morgan Moses, running to his right, blocked corner Trumaine Johnsonandthen shoved him to the ground as Thompson ran past. A scuffle then broke out among a small group of players, and the numbers quickly increased as many tried to pull teammates away. Redskins tackle Trent Williams then walked over and shoved a Jets player and a melee ensued, with the players spilling over near the crowd, separated from the field by a rope. As some players threw punches, coaches tried to pull players aside. Meanwhile, fans recorded; the media is not allowed to shoot that portion of practice. "It was a cheap shot," Williams said of the hit on Moses. "We reacted how we reacted." Thompson said he saw Moses' initial block on Johnson, which he said didn't seem too bad. "But I guess once I got past him, there was a cheap shot thrown or something," Thompson said. "I don't know what happened. It got pretty bad, and that's something that happens when we have joint practices. You're going to protect your teammates at all costs if you feel it's a cheap shot. We're going against someone else in these long practices and it's going to get chippy. Guys are going to want to fight." At the end of fight, as players finally settled down, a fan in a Jets T-shirt slapped hands with New York defensive lineman Leonard Williams. Moses, who underwent surgery on both ankles in the offseason, walked with a limp off the field. A short time later, another fight nearly broke out on the opposite sideline involving Moses, clearly upset over what happened. He was escorted from the field by Redskins coach Jay Gruden. The Redskins later said Moses did not suffer an injury. As Johnson walked off the field, under a steady downpour, he kept repeating, with a smile, "It was a friendly competition! It was a friendly competition!" Jets coach Todd Bowles wasn't pleased with the practice. "Intensity is good. Fights are not to be tolerated in pads," Bowles said. "We're not trying to fight them and they're not trying to fight us. If they want to be boxers and wrestlers, they probably would be in another sport. We're trying to get better and they're trying to get better. Some things happen. Overzealousness. I'll talk to my guys and Coach Gruden will talk to his guys. We'll be better at practice tomorrow, because this is just a waste of time for me." On Monday, Gruden took responsibility for his players' actions but saidhe would consider suspending players if they fight again. "It's been addressed and we talked about it last night and we'll talk about it out there," Gruden said. "We'll have a short, quick, fast whistle if something happens, get everything under control. The most important thing for myself and Coach Bowles is to get good work done." A number of Redskins players said they were disappointed in what transpired, robbing them of more work. The Redskins banked on this joint session to help prepare them for situations they can't always control in preseason games. They also wanted to get their starters more work; most did not play in the preseason opener versus theNew England Patriots. "I understand tempers flare," Redskins linebacker Ryan Kerrigan said. "But you've got to be able to control it. I saw a couple different skirmishes ... I saw some fans fighting at one point. Football can bring out the best and worst in people." After the fights versus Houston, a number of Redskins said it helped galvanize them as a group. After practice Sunday, they were ready to put an end to these sorts of situations. "You never want to hit a guy after the play," Washington tight end Jordan Reed said. "That's disrespectful. We're professional athletes; everyone is going to get hot when somebody does that. That's always going to cause problems. "It was chippy the whole day, man. That's what's been going on with joint practices all around the league." In the middle of a joint practice between the Jets and Redskins, a huge scuffle erupts, extending all the way to the sideline.